Here are all the facts, stats and rider profiles for the Red Bull Grand Prix of the Americas. Dovizioso has finished on the podium twice at Austin; finishing third in 2014 and in second place in 2015 after having qualified in second on the grid and enduring a race-long battle with Rossi. In 2016, his race ended while running in third place when Pedrosa crashed into him at Turn 1 on the seventh lap. Over the last two years, he was the highest-placed Ducati rider, crossing the line in sixth in 2017 and in fifth in 2018. Zarco has finished on the podium at COTA twice in the Moto2 class; second in 2015 and third in 2016. 2017 was Zarco’s first year competing at Austin in the MotoGP class; he qualified in fifth place on the grid and finished the race in fifth position after being passed two laps before the end by Cal Crutchlow. Last year, he qualified in fourth but started in third after Marquez was given a grid penalty. That was his seventh successive front row start since Japan the year before. He finished the race in sixth, as the top Independent Team rider. Petrucci retired from the MotoGP race at Austin in 2013 with mechanical problems after thirteen laps. He finished 17th in 2014 in Austin, from 22nd place on the grid. He finished in 10th place in 2015 after battling with Viñales for much of the race, losing out to him just two laps from the finish. Petrucci missed the race in 2016 as he was still recovering from an operation to his right hand. In 2017, he scored his best result so far in Austin, finishing in 8th ahead of Lorenzo. Viñales finished second in Moto3 at Austin in 2013, less than a quarter of a second behind Rins. In 2014, he won the Moto2 race in Austin, in just his second start in the intermediate class of GP racing. 2015 was Viñales first time riding a MotoGP bike in America; he finished in 9th. In 2016, he started in fourth place on the grid and finished the race in fourth position after getting a bad start and dropping down to 10th in the early stages. In 2017, he started from second on the grid; he was in fourth position when he crashed out of the race at Turn 18 on Lap 2. Last year, he qualified in second but started from pole after Marquez was given a grid penalty for riding slowly ahead him in Q2. He finished the race in second place, equalling Yamaha’s best result at the track. Abraham did not make the start in Austin in 2013 due to a broken collarbone suffered when he crashed in qualifying, in a collision with Bryan Staring. He finished 14th in 2014, his best result on the track so far. He didn’t score any points in 2015 after retiring or in 2017 after crashing on the second lap, and last year he retired because of the pain he had following a crash sustained in qualifying. In 2015, Quartararo stood on the podium in the Moto3 race in Austin for the first time in what was the second race of his Grand Prix career, finishing in second. This is his best result at the track so far. In 2016, he qualified in ninth and finished the Moto3 race in 13th in America. Quartararo’s best result in Austin in Moto2 is 12th during his rookie season, from 16th on the grid. Last year, he scored one point, crossing the line in 15th after qualifying in ninth. 2019 will be Quartararo’s first race in Austin on a MotoGP bike. In 2017, Morbidelli won the Moto2 race in Austin after qualifying on pole position for the second time in his Grand Prix career. Before that win, his best result across the line in the Moto2 class in Austin was 5th back in 2015. He still holds the best lap record for the Moto2 class at the Circuit of the Americas. Last year was Morbidelli’s first year competing at Austin in the MotoGP™ class; he qualified in 17th and crossed the line in 21st behind Xavier Siméon. In 2013, Iannone finished 10th in Austin in just his second appearance in MotoGP. In 2014, he finished seventh, dropping back in the latter stages of the race after battling for a podium finish up to Lap 15. In 2015, he finished in fifth after getting held up by an incident involving Redding and Pol Espargaró on the opening lap. In 2016, Iannone was penalised by three grid positions after knocking his teammate off in Argentina, meaning he started from seventh position; finished the race on the podium in 3rd place. In 2017, he scored his first points with Suzuki, finishing in seventh after qualifying in 11th on the grid. In 2018, Iannone scored his first podium on the Suzuki with a third-place finish after starting in second on the grid behind Viñales. In 2017 in Austin, Nakagami finished in third place from fourth on the grid in the Moto2 class – his best result at this track. In 2013, he qualified in 2nd on the grid, but he retired from the race on Lap 7 due to a gearbox problem – the only time he has failed to score points in Austin. 2018 was the first time that Nakagami competed in the MotoGP class at Austin; he qualified in 13th but started the race in 12th after Pol Espargaro was given a grid penalty, and finished the race in 14th. In 2014, he stopped mid-race to change his rear tyre and then crashed on the 13th lap, suffering injuries to his right hand. In both 2016 and 2018, he finished outside the points in 16th and 19th place, respectively, having fallen during the race and remounted. In 2017, Crutchlow finished in fourth place as the top independent rider ahead of Zarco, equalling his best MotoGP result at any of the US circuits. Mir raced twice in Moto3 at COTA in 2016 and in 2017; he took his best result in 2017, having qualified in second – his second front row start in the class – and he crossed the line in eighth. He crashed out of the race in 2017 on Lap 5 while sitting in 21st. In 2018, Mir started from fifth as the top rookie rider on the grid; he finished the race in fourth, which was his best result at that time on what was his third start in the Moto2 class. 2019 will be Mir’s first race in Texas on a MotoGP bike. In 2013 in Austin, Aleix Espargaró was the first CRT rider across the line in 11th place. In 2014, he qualified in fourth place on the grid, behind three Honda riders but after a bad start he ended the first lap down in 12th place and eventually finished in ninth. In 2016, he finished the race in fifth position; his first top five finish since 2014. In 2017, he stopped after mid-race to change his front tyre and finished last in 17th. In 2018, he started from 19th on the grid, made his way through the field to cross the line in 10th place behind Rabat and Miller, the first time he scored points in 2018. Rins has twice won at COTA in the lower classes after qualifying on pole position on both occasions; in Moto3 in 2013 and Moto2 in 2016. Rins also finished on the Moto2 podium at Austin in 2015, crossing the line in third. Rins still holds the all-time lap record in Moto2 in Texas from 2016. In 2017, Rins crashed at Turn 19 during FP3 and broke his left wrist. He was declared unfit for the remainder of the race weekend. Last year, Rins qualified in 11th, but crashed out of the race at Turn 12 mid-race while sitting eighth. In 2014 Miller qualified on pole and won the Moto3 race at COTA, after leading the race at the end of every lap. 2015 at Austin was Miller’s first time riding a MotoGP bike in America; he scored two points, finishing in 14th position, becoming the youngest Australian to score points in the premier class since Brendan Clarke in 2001. Miller did not race in Austin in 2016 following a crash in practice where he cracked bones in his right foot. In 2017, Miller qualified 12th on the grid; he was in eighth on Lap 13 before losing some places to finish in 10th between Lorenzo and Folger. In 2018, he qualified in 18th in Austin, which was his worst qualifying of the season. He made his way through the field to cross the line in ninth after battling with Rabat and A. Espargaro. In 2013, Pol Espargaró crashed out of the Moto2 race in Austin on the fourth lap after qualifying on pole position. In 2014, he passed Iannone on the last lap of the MotoGP race to finish in sixth place. In 2015, he failed to score any points at Austin after being taken out on the first lap by Redding. In 2017, he qualified 21st on the grid and he retired from the race on Lap 10. Last year, he joined Q2 after passing through Q1 and qualified in 12th. He was later given a grid penalty and had to start from 15th on the grid; after dropping down to 17th, he eventually crossed the line in 13th place as the highest-placed KTM rider. Rossi has competed in all 23 MotoGP races held in the USA. Rossi’s best result at Austin came in 2017 when he finished in second position, after passing Pedrosa three laps before the end the race. Rossi has not won in the USA since 2008 at Indianapolis. In 2016, he crashed out of the race in Austin on the third lap when in sixth. In 2018, Rossi qualified in fifth place, making it three Yamahas within the top five on the grid; he finished in fourth place after struggling with the front during the race. Rabat finished second in both the 2013 and 2014 Moto2 races in Texas. In 2016 and 2017, Rabat finished the race in 13th in Austin, having qualified in 20th and in 16th, respectively. Rabat’s best result in the MotoGP class in Austin came last year when he crossed the line in eighth as the second-placed Ducati rider ahead of Miller. Syahrin has competed at Austin from 2014 to 2017, all in the Moto2 class. His best result to date at the track is sixth in 2015. Last year was Syahrin’s first race in the MotoGP class in Austin; he qualified in 16th place, made his way through to the field before crashing out of the race at the first corner while sitting in 12th on Lap 9. In 2018, Bagnaia won his second Moto2 race in Austin, after qualifying in fourth on his way to clinching the title and setting the fastest lap. From 2013 to 2016, Bagnaia raced in the Moto3 class in Austin, with a best result of seventh coming in 2014, from 14th on the grid. In 2017, he failed to score any points in the Moto2 race in Texas, finishing in 16th place. In 2019, Bagnaia will be racing in Austin for the first time on a MotoGP bike. Oliveira finished third in the Moto2 race last year in Austin after having qualified in 12th on the grid; his only podium finish at the track. His best result in the Moto3 class in Austin came in 2013 with a fifth-place finish on the Mahindra. In 2015, Oliveira qualified in second on the grid in Texas in Moto3, but he crashed out of the race with eight laps to go while sitting in third place. Oliveira will be racing in Austin this year for the first time on a MotoGP bike. In 2013 in Austin, Márquez became the youngest ever rider to start on pole and the youngest to win in the premier class – taking both records from Freddie Spencer. He has repeated the results for the last five years at the COTA, each time winning after qualifying on pole position. He has won the last nine MotoGP races that have taken place in the USA – six wins in Austin, three in Indianapolis and Laguna Seca in 2013. In addition, Márquez won the Moto2 races at Indianapolis in both 2011 and 2012, making it wins on his last 12 visits to the US. Last year, Marquez qualified on pole position, but was given a grid penalty after riding slowly on the line ahead of Viñales in Q2. He then started from fourth on the grid, took the lead on the opening lap and crossed the line with a winning margin of 3.560 seconds. 2018 was the third time he qualified on pole position, led across the line on every lap and set the fastest lap of the race in Austin, along with 2014 and 2016. Lorenzo has finished on the podium 13 times from his 20 MotoGP starts in the USA, including 3rd at Austin in 2013 & 2nd in 2016. His two victories in the US were at Indianapolis in 2009 and Laguna Seca in 2010. Austin is one of six current circuits where Lorenzo has not taken a MotoGP win, along with Sachsenring, Sepang, Termas De Rio Hondo, the Red Bull Ring and Buriram. In 2014 at COTA, he made a jump-start, came in for a ride-through penalty at the end of the first lap and then fought his way back to finish 10th. In 2017, Lorenzo finished in ninth after being passed by both Iannone and Petrucci in the latter stages. Last year, Lorenzo qualified in sixth place, but struggled during the race and eventually crossed the line in 11th. 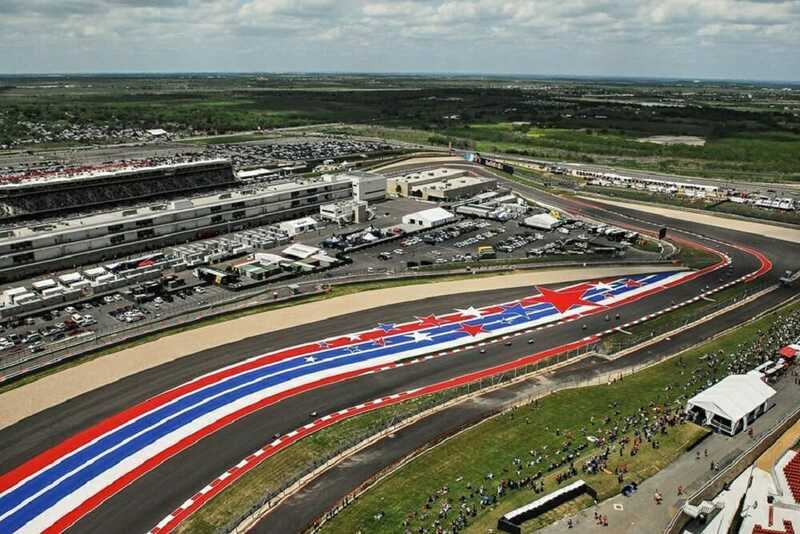 MotoGP returns to the Austin circuit for a seventh successive year. Marc Márquez has won on each of the 10 occasions that he has raced in the MotoGP™ class in America; six times at Austin, three times at Indianapolis and at Laguna Seca in 2013. Maverick Viñales finished second last year at the Austin circuit, equaling the best result for a Yamaha rider at the track after his teammate Valentino Rossi in 2017 and Jorge Lorenzo back in 2016. The six Moto2 races that have taken place at the Circuit of the Americas have been won by six different riders, four of them are now competing in the MotoGP class: Nico Terol (2013), Maverick Viñales (2014), Sam Lowes (2015), Alex Rins (2016), Franco Morbidelli (2017) and Francesco Bagnaia (2018). Only Rins and Morbidelli went on to win the race after qualifying on pole position. The six Moto3 races that have taken place at the Circuit of the Americas have been won by five different riders, two of them are now competing in the premier class: Alex Rins (2013), Jack Miller (2014), Danny Kent (2015), Romano Fenati (2016 and 2017) and Jorge Martin (2018). 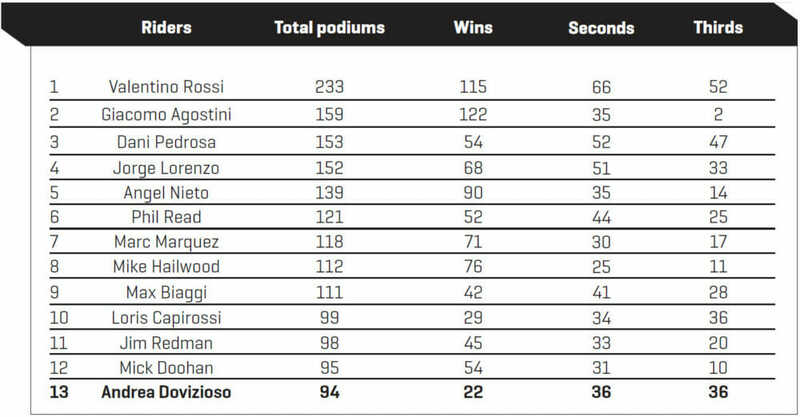 118 – At the Argentina GP, Marc Marquez stood on the podium for the 118th time in his Grand Prix career, three less than Phil Read who stands in sixth place on the list of riders with most podium finishes (see table below). 2.092 – The 15th-place finisher in the Moto3™ race in Argentina, Raul Fernandez, crossed the line just 2.092 seconds behind race winner Jaume Masia; this is the fourth closest top 15 of all-time in Grand Prix racing. Takaaki Nakagami finished seventh in Argentina, which is his best dryweather result since he stepped up to the MotoGP™ class. He is now in second place in the Independent Team riders classification with 16 points behind his teammate Cal Crutchlow (19). With Miguel Oliveira, Fabio Quartararo in eighth and Francesco Bagnaia in 14th, all of the four rookies this year have now scored points. Francesco Bagnaia (2018) is the only one of the four rookies in the MotoGP class this year to have previously won at COTA in any of the smaller classes. In Argentina, Lorenzo Baldassarri won for the fourth time in the Moto2 class, equalling Alex Rins, Mika Kallio and Maverick Viñales. He became the third Italian rider to take back-to-back Moto2 victories, joining Franco Morbidelli and Francesco Bagnaia. In addition, with his win at Termas de Rio Hondo, Lorenzo Baldassarri stood on the podium for the 10th time in the Moto2 class, one less than Jonas Folger and Sam Lowes. Lorenzo Baldassarri is the first rider to win the opening two Moto2 Grand Prix races since Franco Morbidelli in 2017. Shinya Nakano (2000) is the last rider to have won the opening two races in the intermediate category without winning the title at the end of the year. Since then Daijiro Kato (2001), Manuel Poggiali (2003), Jorge Lorenzo (2006 and 2007) and Franco Morbidelli (2017) went on the win the title in the class after winning the opening two races of the season. On his five visits in Austin in the Moto2 class, Lorenzo Baldassari has scored points only once, last year when he crossed the line in 10th after qualifying in 17th. Remy Gardner crossed the line in second place at the Argentina GP, which is his first podium finish in what was the 67th race of his Grand Prix career. Remy Gardner’s second place at Termas de Rio Hondo is the second podium finish for an Australian rider in the Moto2™ class, along with Anthony West who won the Dutch TT back in 2014. Gardner became the 13th different Australian rider to stand on the podium in the intermediate category, the 31st in all solo classes of Grand Prix racing. Somkiat Chantra crossed the line in 10th place at Termas de Rio Hondo, which is the best result in Moto2 for a Thai rider since Ratthapark Wilairot was eighth in France back in 2012. Sam Lowes (2015) is the only rider on the current Moto2 grid to have won in the class at the Austin circuit, while Alex Marquez is the only rider of the current field to have qualified on pole position in the class. Dominique Aegerter (2014), Sam Lowes (2015 and 2016), Tom Lüthi (2017) and Alex Marquez (2018) are the only four riders on the current Moto2 grid who have stood on the podium in the Moto2 class at the Austin circuit since its introduction to the calendar in 2013. At the Americas GP, Dominique Aegerter is scheduled to make his 200th Grand Prix start, becoming the fourth Swiss rider to reach this milestone in the history of Grand Prix racing along with Tom Lüthi, Bruno Kneubühler and soon-to-be MotoGP Legend Stefan Dörflinger. Jaume Masia won for the first time in his Grand Prix career in Argentina, becoming the 44th different Spanish rider to win in Grand Prix racing, the 30th in the lightweight category and the 11th in the Moto3 class. Jaume Masia’s win at Termas de Rio Hondo is the 58th for Spain in the Moto3 class. Last year, Masia started from 10th place on the grid, but crashed on the opening lap at Turn 1. He rejoined the race to eventually cross the line in 21st. With Can Öncu in Valencia last year, Kaito Toba in Qatar and Jaume Masia in Argentina, this is the first time there have been three successive first-time Grand Prix race winners since the introduction of the Moto3 class in 2012. Following Argentina, Kaito Toba leads the Moto3 Championship standings with a score of 31 points. This is the lowest score for a rider leading the Championship in the lightweight category after the opening two races of the year since 1995 when Haruchika Aoki led with 25 points ahead of Kazuto Sakata (23 points) after Malaysia. Darryn Binder crossed the line in second in Argentina, which is the second podium finish of his Grand Prix along with Japan last year. With Jaume Masia winning the race, this is the first time there are at least two KTM riders in the first two places since Le Mans last year. Tony Arbolino scored his first podium finish at the Argentina GP, crossing the line in third place, becoming the 14th different Italian rider to finish on the podium in Moto3. Romano Fenati is the only rider on the current Moto3 grid who has won at the Austin circuit and the only one who has stood on the podium at the track. Romano Fenati won for the second successive time in 2017 at the Austin circuit in the Moto3 class to become the first rider to win twice on two different tracks since the introduction the Moto3 class in 2012, in Jerez (2012-2014) and Austin (2016-2017). Marc Márquez’ win at Termas de Rio Honda is the fifth time that he had won at any circuit in the MotoGP class after qualifying on pole position, leading across the line on every lap and setting the fastest lap of the race along with Jerez (2014) and Austin (2014,2016, 2018). Last year in Austin, Márquez claimed his 10th successive win in the MotoGP class in the USA, his 12th including his Moto2 wins at Indianapolis in both 2011 and 2012. Giacomo Agostini holds the record in Finland with 13th successive wins at Imatra: 8 x 500cc (1966 – 1973) and 5 x 350cc (1969 – 1973). In Moto3, rookie Raul Fernandez finished the Argentina GP in 15th place, crossing the line just 2.092 seconds behind race winner Jaume Masia, which is the fourth closest top 15 of the all-time in a full-length Grand Prix race. Marc Marquez has qualified on pole and won all six MotoGP races that have taken place in Austin. Honda riders have won the last 15 MotoGP races in the USA. The last non-Honda MotoGP winner in the country was Jorge Lorenzo, at Laguna Seca in 2010. Honda riders have qualified on pole for the last 11 MotoGP races held in the USA. The last non-Honda rider to start from pole at any of the US circuits is Jorge Lorenzo at Laguna Seca in 2012. Honda have won 18 of the 23 premier class Grand Prix races that have taken place in the USA in the MotoGP era. In 2001 at Suzuka, Valentino Rossi won the 500cc race, which was the 500th Grand Prix victory for Honda. In 1951, at the first Spanish GP (Montjuich), Umberto Masetti won the 500cc race at an average speed of 93.994 km/h, which is the slowest premier class race. In 1989 at Phillip Island, Alex Criville won the 125cc race, the first of his 20 Grand Prix wins, on his way to clinching the title. In 2000 at the Japanese GP in Suzuka, Youichi Ui won in 125cc, Daijiro Kato in 250cc and Norick Abe in 500cc, which is the only time Japanese riders have won in all three classes at the same Grand Prix. In 1988, Eddie Lawson won the first 500cc race to be held in Laguna Seca, ahead of Wayne Gardner and Niall Mackenzie. In 2005 at the Spanish GP, Valentino Rossi won the MotoGP race following a collision with Sete Gibernau at the last corner. In 2010 at the Qatar GP, Shoya Tomizawa won the first ever Moto2 race. In 1992 at the Australian GP in Eastern Creek, Daryl Beattie replaced injured Wayne Gardner and finished third, his first podium finish in what was his second race in the premier class. In 2009 at the Qatar GP, rain appeared on the MotoGP grid. The start of the race was postponed to Monday evening, which was the first time since June 8th, 1970 that a Grand Prix race took place on Monday. To see what time MotoGP is on TV, visit TV Listings on Cycle News.